Premium grade 18 gauge stainless steel undermount, oversized double sink, featuring big deep bowls, rear drains for more storage below, crease lines and bowl slope to centre of drains for efficient draining, and waste fittings. Silk finish on rim and bowls deliver on bright and shiny good looks, without sacrificing on ease of cleaning. This 1.75 bowl undermount sink features 10 and 7 inch bowl depths and is made of 18 gauge stainless steel. Rear-positioned drain holes offer maximum usable bowl and cabinet storage space, and the large left bowl accommodates bulky items. 3-1/2" stainless steel strainers and undermount clips are included. Available in store by Special Order Only. See associate for details. This single bowl undermount sink is made In Germany with unparalleled quality and durability. The premium 18 gauge, 304 series stainless steel features a deep bowl, straight sides and flat bottoms to maximize bowl capacity. The off-centred, rear-positioned drain hole maximizes usable space under the counter. Available in store by Special Order Only. See associate for details. This double bowl undermount sink features 10 inch bowl depths and is made of 18 gauge stainless steel. Rear-positioned drain holes offer maximum usable bowl and cabinet storage space. 3-1/2" stainless steel strainers and undermount clips are included. Available in store by Special Order Only. See associate for details. 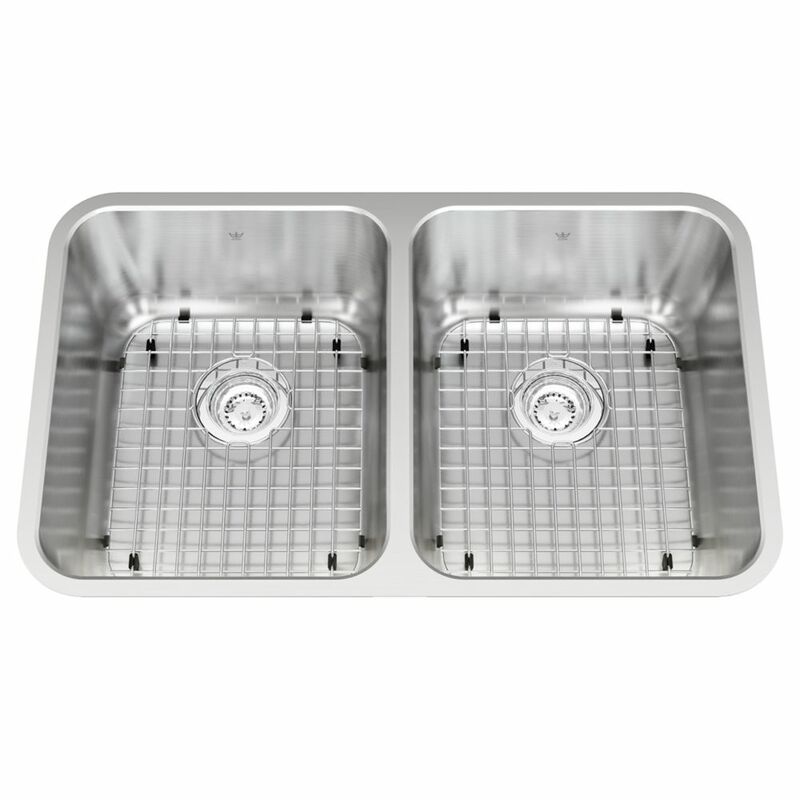 Double UM sink 18 Ga sink Premium grade 18 gauge stainless steel undermount, oversized double sink, featuring big deep bowls, rear drains for more storage below, crease lines and bowl slope to centre of drains for efficient draining, and waste fittings. Silk finish on rim and bowls deliver on bright and shiny good looks, without sacrificing on ease of cleaning.